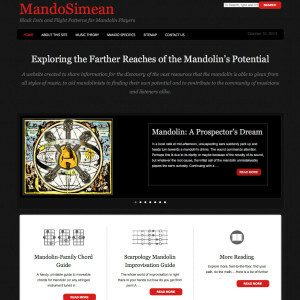 MandoSimean is a website dedicated to the exploration of the mandolin’s potential. Here, mandolin enthusiasts can find reading for enjoyment as well as education on many topics as applied to the mandolin from music theory to philosophy to chord books….you name it. Websentia Web Services created this site in Wordpress using the Genesis-based theme, Ally by AppFinite. This theme was used only as a basic foundation for the design as Websentia worked to bring forth a totally unique look and feel while still keeping with the responsive design and the HTML5 enabled features that add extra SEO advantages such as the use of Schema.Org microdata. This Wordpress website also incorporates features such as user registration for access to special interest information, ebooks, media files and the like.